You all know some Hebrew. In fact, we speak Hebrew every Sunday and I hope every day. Hallelujah! Hallel Praise/Jah, short for Yahweh, or the LORD, Praise the Lord. I hope there is hallelujah in your life daily to our Lord Jesus Christ in the midst of shaking of the foundations. Another word, Sabbath, as in remember the Sabbath day to keep it holy. We are keeping it holy because we need His Word of life for faith to be fed and the fruit of faith, love, to be engendered for the week ahead and every day. Another word: Amen! So be it! Truly! Yes! I hope you pray daily His Word and say the Amen. I should be certain that these petitions are acceptable to our Father in heaven and heard; for He Himself has commanded us so to pray, and has promised that He will hear us. Amen, Amen; that is, Yea, yea, it shall be so. (Luther) This is confident word of faith to the Lord from His Word that He will accomplish His word amongst us. In Psalm 46 the refrain is The LORD of hosts is with us: the Hebrew word for “with us” is IMMANU. And this is another Hebrew word you know in a different form: Immanu-el, el, short for elohim, or God: God with us. This is a name for Jesus Christ as recorded in Matthew’s Holy Gospel: Jesus Christ is God with us. He alone has saved us from sin, death and the power of the devil that fallen man thinks by which he can make himself good. “From Heaven above to earth I come”: Christmas, or Christ Mass. Christ Jesus is born! Immanu-el, God is with us. ““O Lord, We Praise You”: Luther adapted and expanded this medieval communion hymn singing of the One born of Mary who died and rose for all mankind and by that He gives us Body and Blood for the nourishment of our souls in true repentance and the love of and for the Lord. Right in the middle of the Liturgy is His Cross and His risen Body and Blood: Immanu-el, God is with us. “A Mighty Fortress Is Our God”: My Dad once said to me you have to choose a recessional hymn which we can go out humming. “A mighty fortress” certainly fills my Dad’s advice! This hymn, this sung prayer is our daily prayer in the midst of the kingdoms and nations raging and tottering and the earth quaking and seas roaring in daily life. : Immanu-el, God is with us. The Scripture text that is the basis of A Mighty Fortress is our God is Psalm 46. Israel saw the tumult of the earth and were afraid. Worse: the tumult of the nations raging and tottering and the LORD spake and the “earth melts”. Now Luther did not write this hymn to express his own religious or spiritual feelings but to interpret and apply the 46th Psalm to the church of his own time and its struggles amidst the nations. Luther wrote hymns not as a means for self-expression but to serve his fellow believers. By the Lord’s mighty Word made flesh in Jesus Christ for us sinners, Luther is still so serving his fellow believers today in the Word of God Psalm 46 through his hymn. Yes, the Lord was in His Temple in Jerusalem but fully the Psalmist, inspired by the Holy Spirit, is praying and singing that it is not trust in a place, Jerusalem, that saves but the Presence: THE LORD is immanu, with us. He is our mighty fortress. When the people of Israel had been freed from Egypt, right after the first Passover, the armed might of the Egyptian Empire, Pharoah, considered to be a god, went in hot-pursuit of what he considered his chattel property. The Israelites then were faced with Red Sea and the whole host of Pharoah behind them. Israel cried out to Moses Is it because there are no graves in Egypt that you have taken us away to die in the wilderness? What have you done to us in bringing us out of Egypt? Moses responded: Fear not, stand firm, and see the salvation of the LORD, which he will work for you today… 14 The LORD will fight for you, and you have only to be silent.” It seems as if the Lord silenced one Martin Luther, dead in his tracks, trying to save himself by recreating himself spiritually in a monastery. He found out he could not. The Law of God silenced Martin. Martin was full of fear that though an “impeccable monk” he could not fulfill God’s Law. Be still, Martin, and know that I am God and God showed Luther the cross of His beloved Son Jesus Christ and the love which stretched out His hands to him, to us. The just shall live by faith in Jesus Christ who gave up himself for me and thee. 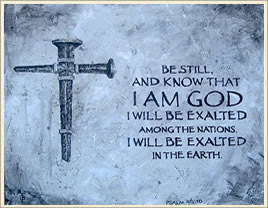 And around and through and because of the Cross comes the Word of God: Be still and know that I am God. And God, Jesus Christ was utterly silenced: Into Your Hands I commend my spirit. And He died. You can not storm heaven or take by violence. He is risen to bring you to Himself, Immanu-el. You can save a dime but not your time. Jesus Christ is the friend of sinners and tax collectors and Martin and you and I. Not to accept them but forgive and transform them. As much as we think we control good and evil, it is good and evil that controls us and nothing inside can change it. Without our help He did us make without our help He did us save. Immanu-el. We shall wield these weapons, but they will not come from ourselves. Immanu-El, God is with us. For the Word created heaven and earth and all things [Ps. 33:6]; the Word must do this thing, and not we poor sinners. In short, I will preach it, teach it, write it, but I will constrain no man by force, for faith must come freely without compulsion. Take myself as an example. I opposed indulgences and all the papists, but never with force. I simply taught, preached, and wrote God’s Word; otherwise I did nothing. And while I slept [cf. Mark 4:26-29], or drank Wittenberg beer with my friends Philips and Amsdorf,6 the Word so greatly weakened the papacy that no prince or emperor ever inflicted such losses upon it. I did nothing; the Word did everything. Almighty God, our Maker and Redeemer, we poor sinners confess untoThee that we are by nature sinful and unclean and that we have sinned against Thee by thought, word, and deed. Wherefore we flee for refuge to Thine infinite mercy, seeking and imploring Thy grace for the sake of our Lord Jesus Christ. The Lord has had mercy upon you. Luther chose Psalm 46 as the basis of “A Mighty Fortress is our God”. He too saw kingdoms tottering as two fronts pressed in upon each other. The clash of the Church struggle affected kingdoms and nations. “… if the foundations are destroyed, what can the righteous do?” (Psalm 11: 3). In Luther’s day, they saw the armies of Islam on the doors of Vienna, Austria. He composed his hymn “Lord, Keep Us Steadfast in Your Word” as a prayer directed for the possibility of the destruction of the Holy Roman Empire. Luther and the Reformers knew a greater shaking in the midst of the Church and the nations and the “foundations are destroyed”. It is what we built, created, managed and manipulated, in the foolishness of the denial of original sin and hubris, that we said would last…last even a 1,000 years. See the tower of Babel: we will make a name for ourselves, lest we be scattered. First: it is clear from Psalm 46, the tottering of kingdoms, signified by the tumult of nature, is the Lord’s doing! See, “…how He has brought desolations on the earth.” He is the Lord of history and is at work, as He fully entered into history. He fights by our side with weapons of the Spirit. The war is not against flesh and blood but the powers and principalities, He alone has the streams of living water that makes glad the city of God…not us. But the question is not answered: What is the righteous to do when the foundations are destroyed? When “..the best laid plans of mice and men go oft astray/and leave us nought but grief and pain, For promis’d joy” (Robert Burns) WE thought our best laid plans would bring promised joy but they have not. What are we to do? In church and nation, we cry out, we got to do something!!! The Reformers actually did not want to reform the Church. First, they thought the Lord by His Word would reform the Church, but not them. In all of Luther’s 60 plus volumes of writings the words ‘reform’ and “reformation” are used by him only a couple of times. Many before Luther and the Reformation wanted to reform the Roman Catholic Church’s horrendous morals especially in the papacy. Luther and company knew moral reform would come about but not from reformation but restoration. Their fingers never pointed at the papacy with a moralistic Tsk, tsk. They knew the “tsk,tsk” of legalism trying to save one self and every spiritual self-help scam like indulgences. They pointed their fingers, their souls and bodies to the Cross of Jesus Christ and the Bible and that is what got them into trouble. The blessed Reformers and the Reformation was actually a restoration, a recovery, a rediscovery of the pearl of great price that was already there and had been: the Gospel of Jesus Christ and the inerrant Word of God, the Bible, sola Scriptura, Scripture alone. Now the Roman Church believes that Scripture is authoritative and inerrant. The radical nature of the Reformation was the word, “sola”. Scripture alone. Not the opinions and theologies of men, not the spiritualities and religiosities and life experiences of men and women, not works, not keeping the Law, form the saving doctrine. The saving doctrine is formed in God’s Word in the Bible and Scripture points us unfailingly and inerrantly to Jesus Christ. The saving doctrine is formed by Christ Jesus’ death and resurrection and all of the Lord’s history: from the beginning when God created the heavens and earth, and you and I, out of sheer grace to Israel’s being freed by no decision of their own. This forms the saving and pure doctrine of salvation by grace through faith alone. Once the move is made, even in one jot or tittle of the Word, to change it, following our own ideas, then how do such people believe in Christ, I ask? (Luther’s question) There is something else you have to do besides faith in Jesus Christ. So, you could pray to Mary and saints, say Masses for the dead, invent purgatory and a method to get people out of purgatory (indulgences), invent monasteries and convents so one could be a real Christian and the like. Luther and the blessed Reformers found again the pearl of great price. The Church has been likened to a ship. Nave is the area in a church building where the people sit. Nave comes from the Latin word, navis whichmeans ship. But barnacles were threatening her hull and her sailing. It’s hard enough to sail through the rough waters of sin, death and the power of the devil throwing monster storms at the Lord’s people aboard by seeking a different captain and threatening mutiny all the time. In Bible study we looked at Hebrews 12: 1 where the preacher says Jesus is the “founder” or “pioneer” of our faith, but I think the King James version is right on target: He is the captain of our faith. Thinking our tongue is rudder steering her is the navigation to shipwreck. More than one Lutheran took little counsel seeing the pictures of the shipwreck of “Concordia”. The arrogant boast of the heretic, “With our tongue we will prevail, our lips are with us; who is master over us?” (Psalm 12) The Reformers knew and we know it is the Lord’s Word which steers, His Holy Spirit that fills the sails, and the Cross the sure mast. Our tongues, our theologies will so easily steer the ship the wrong way. Look at the ships also: though they are so large and are driven by strong winds, they are guided by a very small rudder wherever the will of the pilot directs. 5So also the tongue is a small member, yet it boasts of great things. (The Epistle of James) When church leaders, pastors, ministers and bishops start following their own ideas about the faith, how can the people, how can we believe in Jesus Christ? (from Luther) “For to believe in Christ is to reach out to Him with one’s whole heart and to order all things in accord with Him.” (Luther) Why? He’s God! He knows us better than we do ourselves. And so we may boast in Him and His love for us all and go the true way, as in I am the Way, the Truth and the Life, no one comes to Father but by Me. The Reformers sold all they had to buy the land for the pearl of great price. The true icon of Jesus Christ and His Church had been there but forgotten. Hymnody, as we know it, was also a gift from the Reformation and an outpouring of music, from Luther to Bach. But probably a lot of Lutherans do not know there was an outpouring of painting and engravings and woodcuts, of the visual arts: Albrecht Durer, Hans Holbein the younger and Lucas Cranach, the elder and younger, father and son. The painting on the full cover on the bulletin (here reproduced) and up here on whiteboard is by Lucas Cranach the Elder and it’s part of the Altar triptych at Marienskirche in Wittenberg. The original artwork is the predella (lower panel) of the altar that runs beneath a triptych that features baptism (in the left panel), the Lord’s Supper (in the large central panel), and absolution (in the right panel). I call the predella, Luther preaching. “I preach Christ and Him crucified” is the center of preaching. Baptism is into the death of Jesus so that as He lives we too might walk in the newness of life. In 1 Corinthians 11, after Paul passes on the Words of Institution, it is written: “For as oft as ye eat of this bread and drink of His blood you proclaim the Lord’s death until He comes.” The crucifix, Jesus’ death and resurrection is front and center in the life of the Church. There are several ways this painting proclaims the centrality of Christ in Lutheran preaching. First, note the crucified Christ is front and center in the painting, drawing the attention of most “In evangelical terms, he preaches the crucified Christ so clearly, obviously and directly, as if the listeners could look at him painted before their eyes” In fact, in Galatians St. Paul wrote them, O foolish Galatians! Who has bewitched you? It was before your eyes that Jesus Christ was publicly portrayed as crucified. Galatians 3:1 One Biblical scholar wrote that the sense of the Greek in that verse is, I put Christ and Him crucified as on a billboard for you. Notice the wavy loin cloth, a victory flag, He is risen and this is not the end of the story. He is the pioneer and perfector of our faith as it is written in Hebrews, our Captain. His earthly ministry continues in his heavenly ministry of the Church so we can be made holy by His gifts of grace to us daily. With one hand Luther points and with another it rests on the Bible. We do not know which Bible passage is open but it says that the inerrant Word of God points us to Jesus. Luther pointed out that every word of the Scripture points to Jesus Jesus Christ. While Scripture knows a thousand ways to proclaim Christ in direct speech, in imagery, and in metaphor, yet all of Scripture shares the same essential purpose that John identified as the heart of his gospel: “These are written that you may believe that Jesus is the Christ, the Son of God, and that by believing you may have life in his name” (John 20:31). Note the Congregation. The man with the long beard is probably Cranach himself. The woman with the young boy is probably Katherine von Bora, Luther’s wife and their son Hans. Hans was a toddler at the time and at that time Luther wrote the Small Catechism and probably heard his son asking, Papa, vas ist das? What is that? In the Catechism the translation is What does this mean? but in German is Vas ist das? Note the girl looking write at us, as if she were posing for a photo, but her eyes are now not looking at Jesus Christ. This is not good, maybe Cranach is suggesting. The congregation is front and center. Christ is no longer important, crucial. They are the reason for season, not Jesus Christ. Notice then that Luther, any pastor is pointing directly at them and no longer to Jesus Christ. Now the preacher points to them the law they can do to be ‘good Christians”. We are called to preach Christ and not the Christian. I have to admit it, I like the sound of Mark Schroeder Ministries, this is the fare of all the Joel Osteens, Rick Warrens and the like. It is Christ Jesus’ Ministry. Eventually, the icon of the Crucified is dropped all together. IN fact, church growth teaches there should be no cross no crucifix and no mention of sin in confession and absolution: No Jesus, except as our helper but not our Lord. And so: leading from behind? No, a teacher is front of his class, the conductor in front of her choir or orchestra, the General in front of his troops: Christ Jesus front and center, the captain of our ship, our lives, our salvation. The Reformers restored the true icon of the Church. It is catholic. The word catholic is from two Greek words, kata holos, according to the whole. According to the whole of our lives. Luther taught that the two most important words in the Lord’s Supper are FOR YOU. According to the whole of Christ Jesus for our lives do we look for our salvation. On the bulletin cover so we can see the whole image I extended Luther preaching on the front and the back and by accident the Crucifix becomes a hinge on the bulletin, the hinge of the door by which the Kingdom of heaven is open to all believers. Now the peace of God, which surpasses all human understanding, guards your hearts and minds in Christ Jesus. Amen. It made for an interesting decor for the Divine Service for the preaching of the Scripture and Sacrament of the Altar. The Bible tells us the wages of sin is death. The Law shows us our sin. Sin is death. Trying to keep the Law is like coloring skulls: the skulls looks prettier but it is not life because the Law does not give life. “For the wages of sin is death, but the free gift of God is eternal life in Christ Jesus our Lord.” (Romans 6: 23) The Lord alone gives life to our souls and will give eternal life to our bones on the last day. Almighty God, You chose Your servants Simon and Jude to be numbered among the glorious company of the apostles. As they were faithful and zealous in their mission, so may we with ardent devotion make known the love and mercy of our Lord and Savior Christ, who lives and reigns with You and the Holy Spirit, one God, now and forever. Memory Verse: Alleluia. You did not choose Me, But I chose you. Alleluia. About Saints Simon and Jude: In the lists of the twelve apostles (Matthew 10:2-4; Mark 3:16-19; Luke 6: 14—16); Acts1:13), the tenth and eleventh places are occupied by Simon the Zealot (or ‘Cannanaean”) and by Jude (or “Judas,” not Iscariot but “of James”), who was apparently known also as Thaddaeus. According to early Christian tradition, Simon and Jude journeyed together as missionaries to Persia, where they were martyred. It is likely for this reason, at least in part, that these two apostles are commemorated on same day. Simon is not mentioned in New Testament apart from the lists of twelve apostles. Thus he is remembered and honored for the sake of his office, and thereby stands before us—in eternity, as his life and ministry on earth—in the Name and stead of Christ Jesus, our Lord. We give thanks to God for calling and sending Simon, along with Jude and all the apostles, to preach and teach the Holy Gospel, to proclaim repentance and forgiveness, and to baptize in the name of the Father and of the Son and of the Holy Spirit (John 4:1-2; Matthew 10: 28:16-20; Luke .24: 46-49). Jude appears in John’s Gospel (14:22) on the night of our Lord’s betrayal and the beginning of His Passion, asking Jesus how it is that He will manifest Himself to the disciples but not to the world. The answer that Jesus gives to this question is a pertinent emphasis for this festival day: “If anyone loves Me, he will keep My word, and My Father will love him, and We will come to him and make Our home with him” (John 14:23). Surely both Jude and Simon exemplified, in life and death, their love for Jesus and their faith in His Word. Not only are we thus strengthened in our Christian faith and life by their example, but, above all, we are encouraged by the faithfulness of the Lord in keeping His promise to them to bring them home to Himself in heaven. There they live with Him forever, where we shall someday join them. “Blessed are they that mourn, for they shall be comforted.” With each beatitude the gulf is widened between the disciples and the people, their call to come forth from the people becomes increasingly manifest. By “mourning” Jesus, of course, means doing without what the world calls peace and prosperity: He means refusing to be in tune with the world or to accommodate oneself to its standards. Such men mourn for the world, for its guilt, its fate and its fortune. While the world keeps holiday they stand aside, and while the world sings, “Gather ye rose-buds while ye may,” they mourn. They see that for all jollity on board, the ship is beginning to sink. 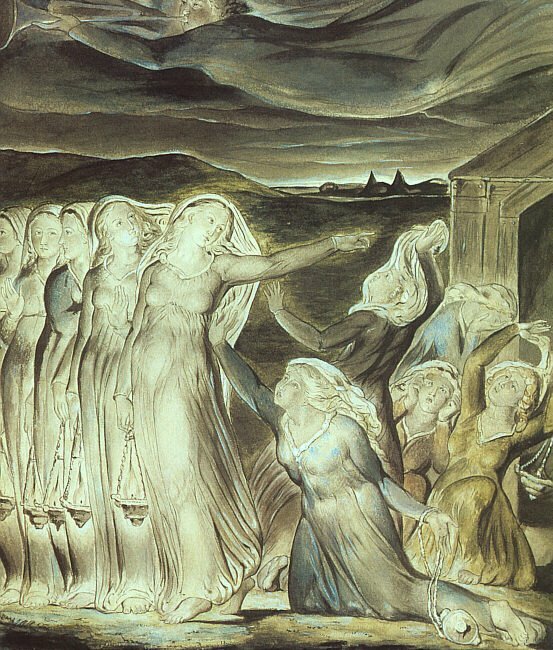 The world dreams of progress, of power and of the future, but the disciples meditate on the end, the last judgement, and the coming of the kingdom. To such heights the world cannot rise. A blessed feast day to all in the Lord! Almighty God, the apostle Paul taught us to praise You in psalms and hymns and spiritual songs. We thank You this day for those who have given to Your Church great hymns, especially Your servants Philipp Nicolai, Johann Heermann, and Paul Gerhardt. May Your Church never lack hymnwriters who through their words and music give You praise. Fill us with the desire to praise and thank You for Your great goodness; through Jesus Christ, our Lord, who lives and reigns with You and the Holy Spirit, one God, now and forever. Amen. Bio: Philipp Nicolai (1556–1608) was a pastor in Germany during the Great Plague, which took the lives of 1,300 of his parishioners during a sixth-month period. In addition to his heroic pastoral ministry during that time of stress and sorrow, he wrote the texts for “Wake, Awake, for Night Is Flying” and “O Morning Star, How Fair and Bright,” known, respectively, as the king and queen of the Lutheran chorales. Johann Heermann (1585–1647), also a German pastor, suffered from poor health as well as from the ravages of the Thirty Years’ War (1618–1648). His hymn texts are noted for their tenderness and depth of feeling. Paul Gerhardt (1607–1676) was another Lutheran pastor who endured the horrors of the Thirty Years’ War. By 1668 he lost his pastoral position in Berlin (for refusing to compromise his Lutheran convictions), and endured the death of four of his five children and his wife. He nevertheless managed to write 133 hymns, all of which reflect his firm faith. Along with Martin Luther he is regarded as one of Lutheranism’s finest hymn writers. Reflection: The last fad in congregational music was “Christian music”. My response was, Yes, I love Christian music,written and composed by Heerman, Nicolai and Gerhardt! On this day we sing to the Lord in the words and music by the 3 great Lutheran hymn writers commemorated and it is all thoroughgoing Christian and Biblical music. Now the latest buzz phrase has been: “praise songs”. Both my wife and a colleague responded to “praise songs”: ‘We sing praise music every Sunday!” Listen to the hymns below! As friend and colleague once would say: “Lutheran hymnody is my glossasalia.” Just think: these hymn writers and pastors were probably not paid a cent for their hymns, fought false doctrine and disease and the devil, and in the midst of all that, in the Lord they had joy to sing and pray and write hymns. The other criticism is that Lutheran hymnody is not personal enough and expressive of ‘my’ feelings. Can anyone, if you will, top, the sheer intimacy, poetry and passion of Paul Gerhardt in O Sacred Head, Now Wounded? What sustained these men through such turmoil? The rock of salvation, Jesus Christ. Faith can only have something or someone to seize for salvation and this is the justification of the sinner by Christ’s Atonement, once and for all from the Cross, preached and taught into our ears and hearts, by sermons, yes! But also by hymnody. In the Service Book and Hymnal (1958), the former worship book of the ELCA’s predecessor Lutheran denominations, the forward states that they wanted the hymns to be more “devotional” and have a less of a “didactic” content. They were so wrong! The didactic or teaching content of Lutheran hymnody is so important because it is the objective Word of God written in Scripture sung in words and music. Consider “Wake, Awake, for Night is Flying”: this hymn is the Parable of the Foolish and Wise Virgins (Matthew 25: 1-13) set to music. It is usually sung in Advent, pointing to the time on earth when the Bridegroom arrived and the time to come when those who are eager for His appearing, He will come again. It is didactic and so instructional. Dispensationalist and millenialist false doctrine is shown for what it is in that magnificent hymn of Scripture by the true and correct doctrine of our Lord’s parousia, in Scripture, correctly taught. At Concordia Junior College, I took a one credit course on hymnody. Professor “Ollie” Rupprecht pointed out that J.S. Bach had some 80 volumes in his library (quite an expensive acquisition in that day) and 60 volumes were on Lutheran Doctrine. This doctrine has been derided as too “sterile”. It is not. Like Jack Webb in Dragnet said: “The facts, ma’am, just the facts.” The objective justification by the life, word and work of Jesus Christ is the reason to sing.